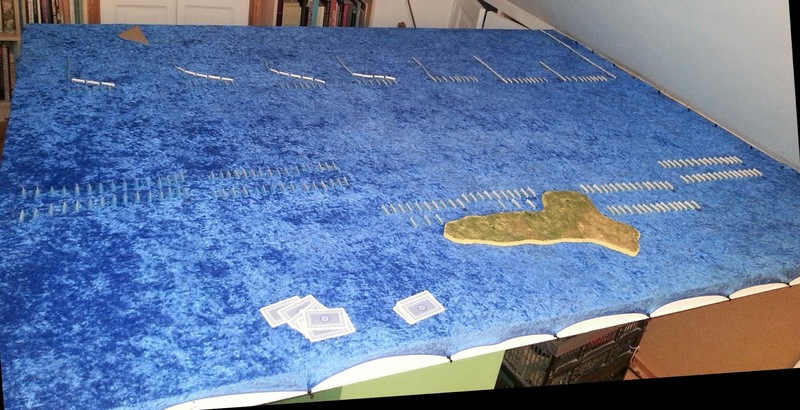 Ongoing test with 270 triereis (simple card prints) on a 6x8 table. I will redo this with Outpost 1/3000 ships when they are painted ! Historical deployments. Athenians covering the western island. The Peloponnesian fleet starts to form a battle line. Athenian flanks advance to put pressure on opponents. P. commander will soon face twice as many ships as he has in his squadron.Historically he was killed - maybe this is why ? 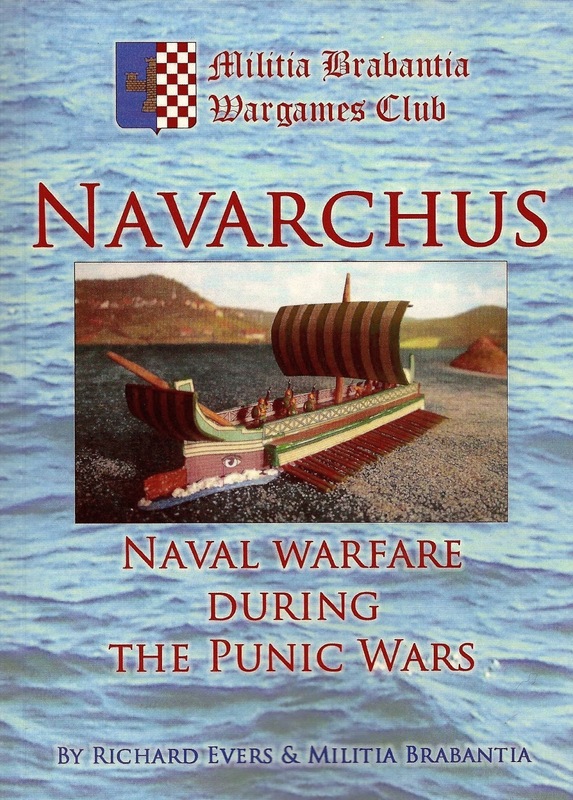 NAVARCHUS, by Richard Evers has not got much attention from gamers as far as I have read. It should get more. It was published in 2013. 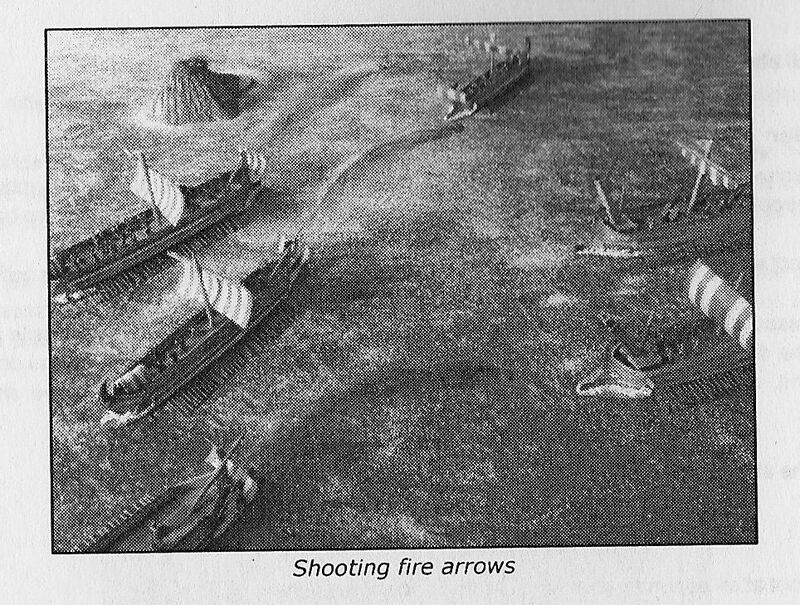 This is a rules set for 1/300 galley warfare aimed specifically at the Punic Wars. 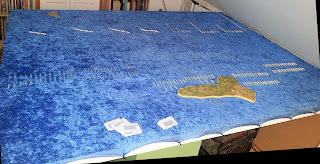 A typical game has up to 12 ships a side organised in squadrons of 3, so this is a game for tabletop clashes with detail and colour rather than full-size refights of ancient battles. The book is available in full colour or black and white from LULU:COM. It is 74 pages in A3 size. There are templates and a quick-reference sheet. There is a minimal amount of background material and a list of engagements for the Punic Wars period. Two things I particularly like are that the author sets out his priorities - playability, detail, period - and the book gets across some excitement and enthusiasm for the topic. The game is not reductionist, it includes desirable detail to give atmosphere and historical accuracy but is playable because it has been tested. One-Brain-Cell Rules do not rule, in my opinion. The scale Evers and his wargames group, Militia Brabantia, prefer is 1/300 but the rules can be used in scales from 6mm to 28mm. One nice aspect is that one can use ROMAN SEAS card ships. They repaint them and set broom-bristle oars on them and make other customisations. There are plenty of photos in the book, including some of games, models and historical remains. There are also diagrams which are very clear and which supplement explanations of rules very well. There suggested scenario formats and a ship characteristics table - up to a '6' - and a points system. I have written on this blog about the brain-killing possibilities in accurately and simply reflecting ship movement. 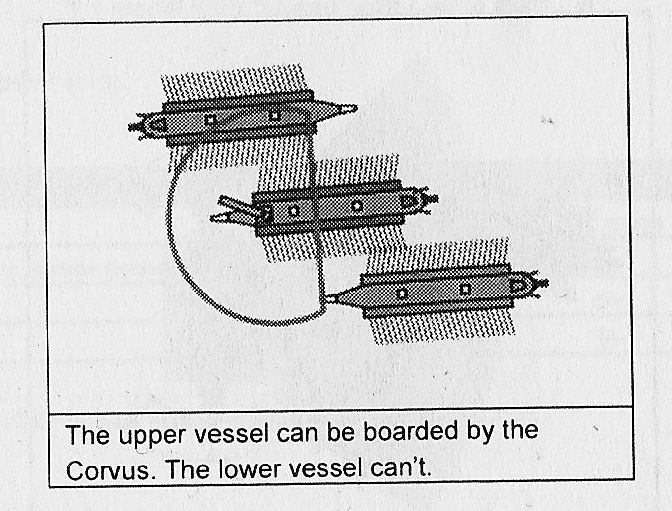 Here ships make 'normal' or 'closing-in' moves i.e. attacks. This rules set has a neat solution in determining who moves first and how conflicting moves are resolved. The players have to give orders each turn and a ship which is first to move may not be the first to fight. A flow-chart to make this go more smoothly is included. Ships can move under sail or oars. The game uses templates which set out zones within which a ship can move and turn. Deck troops and artillery can shoot at other ships. 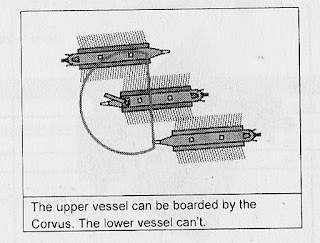 Marines can 'jump' onto other ships or defend their own or use a 'corvus'. The rules are made to allow for 'heroic actions' and justify painting individual figures. Ships can ram or rake each other. Ships sink without trace, apparently. There is a lot of detail without making the game stodgy. I welcome them as a way to use ROMAN SEAS ships whereas I have generally moved away from 1/300 scale. The set was developed within a wargames club and benefits from the playtesting and priority on making the game interesting. You must think about manoeuvrering and how to get in the attacks you want. It is suited best to a small number of ships but would make a great multi-player game. There are some typos in the book but the author is not a native English speaker and many UK/US books have just as many. In book is very well laid-out and the rules presented clearly. There is no index but in general a very good example of how to do wargames rules. In terms of galley warfare, the focus on getting a feel for the way such ships move and the complexities of multiple ships in combat is well conveyed. 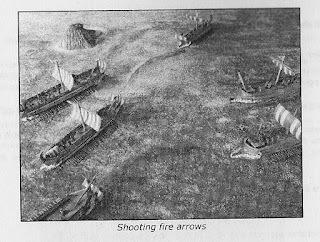 For Punic Wars naval fighting these rules do the job well.